It’s part of an announcement that GM is laying off nearly 15,000 factory and white-collar workers in North America, including those at its Detroit-Hamtramck Assembly plant in Michigan and Ashawa Assembly in Ontario, Canada. Propulsion plants in Maryland and Michigan will also be “unallocated,” as a GM press release states. 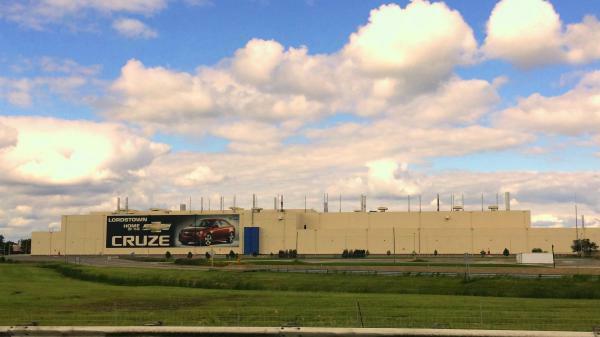 The compact Cruze is the only vehicle built in Lordstown. Slowing sales led to the elimination of two shifts over the last two years and the layoffs of about 3,000 people. The remaining 1,500 people on the first shift had been dealing with uncertainty over the last year. In October, a spokesman for the company said GM remained committed to both the Cruze and continued sales of passenger cars overall. Tom Wolikow, a United Auto Workers activist who was among the earlier layoffs, says the timing of Monday’s announcement was particularly brutal. The announcement was made to employees at a Monday morning meeting. A GM spokesperson was not available to comment, but a press release says the company changes will result in cash saving of approximately $6 billion. “Today, GM is continuing to take proactive steps to improve overall business performance including the reorganization of its global product development staffs, the realignment of its manufacturing capacity and a reduction of salaried workforce. These actions are expected to increase annual adjusted automotive free cash flow by $6 billion by year-end 2020 on a run-rate basis,” the GM statement said. According to Wolikow, GM said it is looking for other product lines that could be moved to Lordstown, but there was no commitment made. Wolikow said the process of doing that could be slow even if it pans out. When GM ended production of the Chevy Cobalt at Lordstown, it had already announced that the plant would be retooled for the Cruze. Lordstown Mayor Arno Hill estimates his community could lose more than $1 million in income tax funds, but he says it’s a contingency they’ve been planning for. Hill added he’s not giving up hope for the plant. “There's been too much work put in by the union, by management, by the village, by the state. This is a statewide issue. There are over 30 other companies which, I won’t say they totally depend on GM but they do supply GM, and the ripple effect is traumatic,” Hill said. “And we are determined to do everything we can to convince General Motors to make Lordstown part of the future of auto manufacturing for this great company that we have been like family with for 52 years,” Green said. Green says he hasn’t heard the term “unallocated” to describe a plant’s status before. Still, Green said hearing Monday’s news “felt like somebody kicked me in the stomach”. President Trump said Monday he had spoken to GM CEO Mary Barra. He said GM informed him the Cruze is not selling well. “I say, ‘Well then get a car that is selling well and put it back in.’” Trump said. He added he is “not happy” about GM’s decision. Republican Senator Rob Portman said he was “deeply frustrated” with GM’s decision and disappointed with the way the Lordstown workers have been treated. “I once again urged GM to make a commitment to bring a new product to the plant, especially since GM is proposing to build a number of new electric vehicles. In the short term, I urged GM to at least reallocate some of the production and employees to the Toledo GM plant,” Portman said in his statement. Democratic Senator Sherrod Brown called GM’s decision “corporate greed at its worst” and said the company does not respect its workers at Lordstown. He accused the auto company of benefiting from the GOP tax bill and “failed to invest that money in American jobs”. “GM owes the community answers on how the rest of the supply chain will be impacted and what consequences its disastrous decision will have on the Mahoning Valley and our state,” Brown said. He criticized President Trump for failing to keep his campaign promises to bring jobs back to the area. “The Valley has been yearning for the Trump Administration to come here, roll up their sleeves and help us fight for this recovery. What we’ve gotten instead are broken promises and petty tweets,” Ryan said in a written statement. In an interview with ideastream, Ryan criticized the Trump administration’s plan to roll back fuel efficiency regulations known as the Corporate Average Fuel Economy (CAFE) standards. Democratic Congressman Tim Ryan criticized President Trump for not “lift(ing) a finger” to keep the GM plant at Lordstown open. President Trump said he wasn’t happy about the move and said GM “better get back in there soon”. “The president threw gas on the fire when he got rid of the CAFE standards – the fuel efficiency standards – that really helped these small car manufacturing facilities stay competitive and kept them in the game,” Ryan said. “There will not be a church, a neighborhood, a school district that won’t be affected by this in our region and that’s how deep the roots of GM Lordstown run in multiple counties, multiple states,” he added. GM opened the Lordstown plant in the late 1960s in the southwest corner of Trumbull County. This is a developing story and we will continue to update it throughout the day. This story has been updated with a statement from UAW Local 1112 president Dave Green on the Drive It Home Ohio campaign as well as statements from the mayor of Lordstown and Ohio elected officials. This story has been updated to include comments from President Trump. The new president of Lordstown’s United Auto Workers union is facing the elimination of another shift and making a vehicle that the company says customers are shifting away from. David Green was sworn in yesterday as the new president of Local 1112, which represents assembly workers at GM’s Lordstown plant. The union also now includes fabrication plant workers – previously Local 1714 – of which Green was the president from 2007 until 2013.